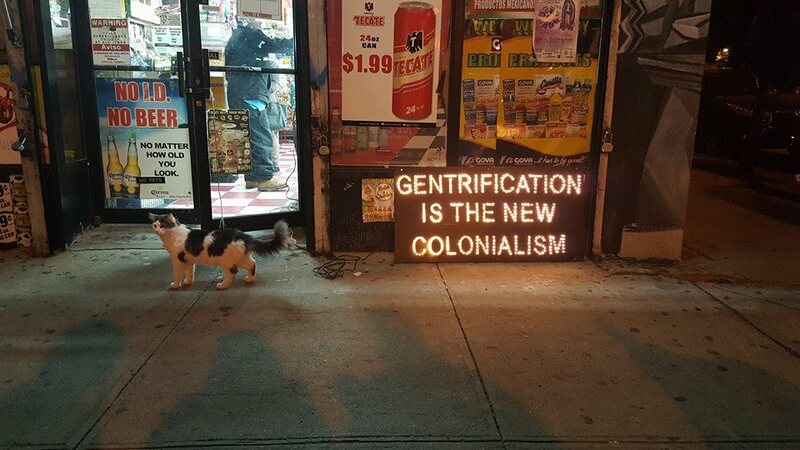 Illumination Against Gentrification. Photo by Patrick Chang. 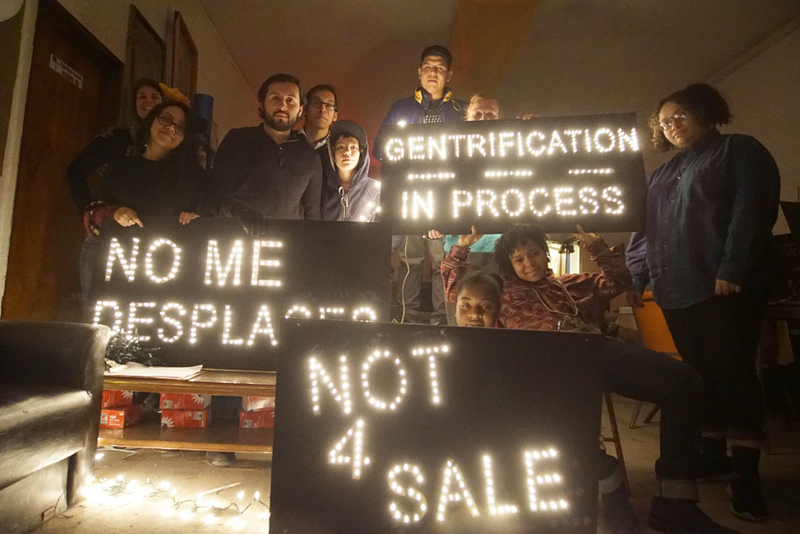 “Mi Casa No Es Su Casa: Illumination Against Gentrification” is a campaign bringing together activists in Bushwick, NY, the Mayday Space artist collective and Athena Soules of the NYC Light Brigade in an effort to bring awareness to, and fight against, the ongoing gentrification of New York neighborhoods. This project brings together community-building in a powerful way. The Mayday Space is a hub of community building and creative activism in the Bushwick neighborhood of Brooklyn. Billing themselves as “your new home for social justice organizing, community empowerment & movement building,” Mayday’s vision is to create a space for “local and global change-makers” to work towards a more just, equitable and democratic city. Members of Overpass Light Brigade had the opportunity to visit Mayday space in September 2014, when it served as the creative hub of the People’s Climate March. 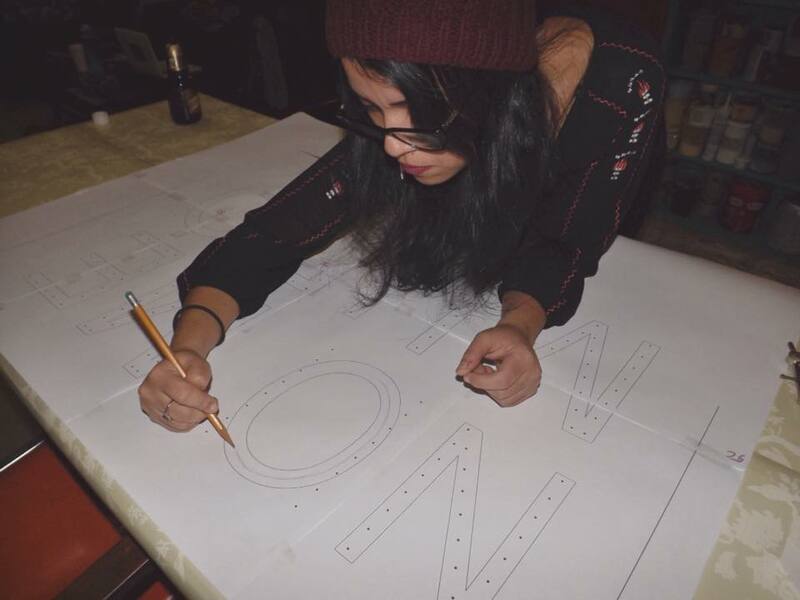 Artists and activists – individuals and orgs – from across the country and the world came to the Bushwick warehouse space to create gigantic banners, floats, signs and other artworks for the march in a celebration of collaboration, cooperation and movement-building. 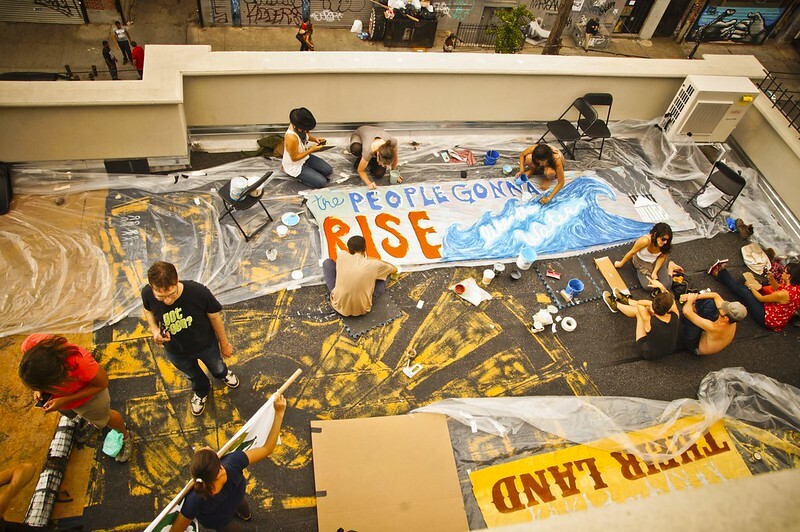 People’s Climate March banner production on Mayday Space roof, September 2014. Photo by Joe Brusky. The NYC Light Brigade has been a member of the Light Brigade Network since 2013 and has been involved in numerous high-profile projects: Fight for 15, Light the Way, Say Her Name, March Against Monsanto, and many other local, national and international campaigns. NYC Light Brigade was also present at the large artist-driven anti-gentrification protests that took place in November outside the Brooklyn Museum, which was then hosting the sixth annual real estate summit. 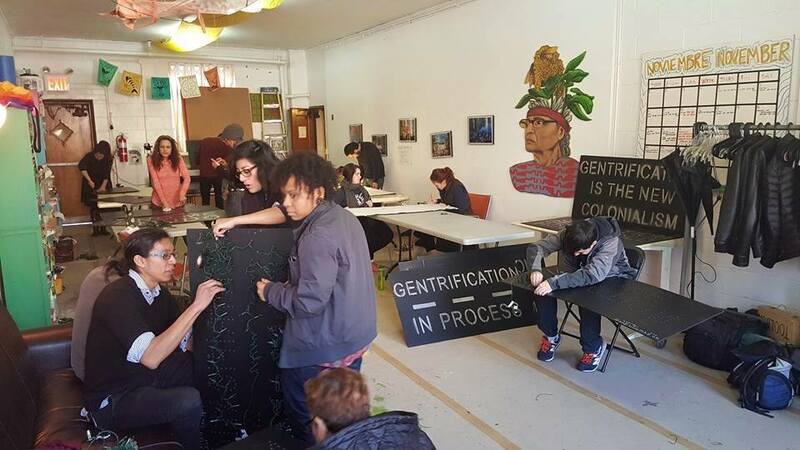 “Illumination Against Gentrification” is a powerful, heartfelt and mediagenic effort by Bushwick residents – spearheaded by local activist Pati Rodriguez – who are fighting to keep their neighborhoods intact for long-time residents. The people who own homes, rent apartments, run small businesses and have built the neighborhood over decades, are now being pushed out by aggressive developers, skyrocketing rent and the overwhelming effects of gentrification. 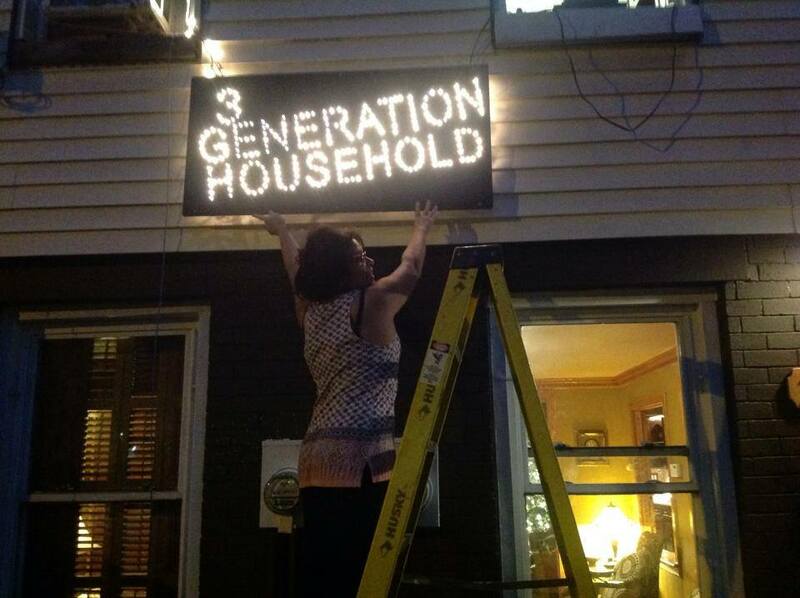 In collaboration with the NYC Light Brigade and Mayday Space, the project went from, as Rodriquez describes, “a collage to post outside my home” to a larger project involving other residents and business-owners, using Light Brigading as the tactic to create awareness and encourage conversation about the problems facing the neighborhood.